“Gaussian processes” are processes with Gaussian marginal distributions, like Brownian motions and suchlike. Very prominent in, e.g. spatial statistics. When you see it capitalised it tends to means a specific emphasis, on the use of these processes for regression, as nonparametric method with a conveniently Bayesian interpretation. The basic trick is using covariance estimation and/or Gaussian process simulation on some clever Hilbert space to do functional regression. I feel this is not too complex but I’ve not looked deeply into it. They reputedly work well with kernel methods to do machine learning stuff, apparently. The details of this are still hazy to me, and they aren’t currently on the correct side of the hype curve for me to dive in. I’ve not been very enthusiastic about these in the past for the reason of it not being worth it. It’s nice to have a principle nonparametric Bayesian formalism, but it’s pointless having a formalism that is so computationally demanding that people don’t try to use more than a thousand datapoints. However, perhaps I should be persuaded by AutoGP (BoKD16) which breaks a lot of the awful computational deadlocks by clever use of inducing variables and variational approximation to produce a compressed representation of the data with tractable inference and model selection, including kernel selection, and doing the whole thing in many dimensions simultaneously. 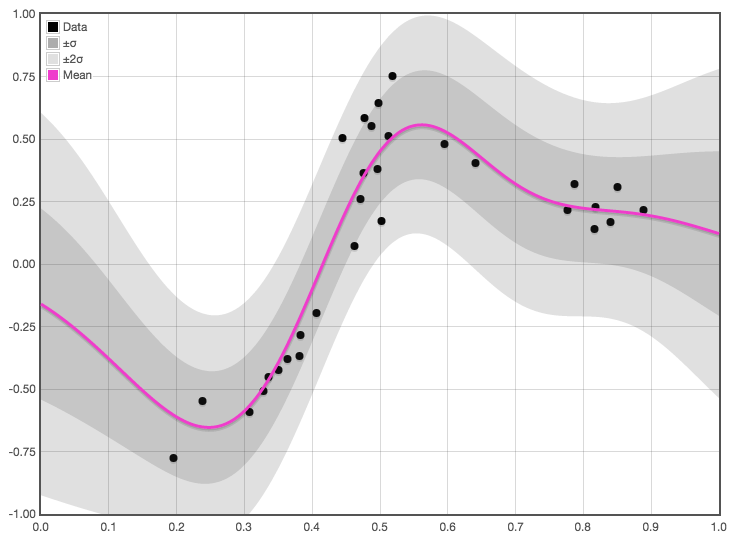 The current scikit-learn has semi-fancy gaussian processes, and an introduction. Gaussian Processes (GP) are a generic supervised learning method designed to solve regression and probabilistic classification problems. The prediction interpolates the observations (at least for regular kernels). The prediction is probabilistic (Gaussian) so that one can compute empirical confidence intervals and decide based on those if one should refit (online fitting, adaptive fitting) the prediction in some region of interest. Versatile: different kernels can be specified. Common kernels are provided, but it is also possible to specify custom kernels. They are not sparse, i.e., they use the whole samples/features information to perform the prediction. They lose efficiency in high dimensional spaces – namely when the number of features exceeds a few dozens. Is that last point strictly true? Surely an appropriate kernel could ameliorate the dimensionality problem? There are even fancier gaussian processes. Chris Fonnesbeck mentions GPflow, autogp, PyMC3, and the scikit-learn implementation. Plus I notice skgmm is a fancified version of the scikit-learn one. So… It’s easy enough to be bikeshedded is the message I’m getting here. George is another python GP regression that claims to handle big data at the cost of lots of c++. Can you somehow make them (in some sense) sparse after all, using kernel approximation techniques? Is this what the variational version does? GP models are the meeting of Covariance estimation and kernel machines. The Matérn stationary (and in the Euclidean case, isotropic) covariance function is one model for covariance. See Carl Edward Rasmussen’s Gaussian Process lecture notes for a readable explanation, or chapter 4 of his textbook (RaWi06). Looks interesting. Without knowing enough about either to make an informed judgement, I imagine this makes the Gaussian process regression soluble by making it local, i.e. Markov, with respect to some assumed hidden state, in the same way Kalman filtering does Wiener filtering. This would address at least some of the criticisms about sparsity etc. This is the trick that makes AutoGP work. (BoKD16). TBD. For now see Kernel approximation. This lecture by the late David Mackay is probably good; the man could talk. QuRa05: (2005) A Unifying View of Sparse Approximate Gaussian Process Regression. Journal of Machine Learning Research, 6(Dec), 1939–1959. KaSä16: (2016) Approximate state-space Gaussian processes via spectral transformation. KiWe14: (2014) Auto-Encoding Variational Bayes. In ICLR 2014 conference. KBCF16: (2016) AutoGP: Exploring the Capabilities and Limitations of Gaussian Process Models. In UAI17. LDGT14: (2014) Automatic Construction and Natural-Language Description of Nonparametric Regression Models. ArXiv:1402.4304 [Cs, Stat]. TiLa10: (2010) Bayesian Gaussian Process Latent Variable Model. In Proceedings of the Thirteenth International Conference on Artificial Intelligence and Statistics (pp. 844–851). FLSR13: (2013) Bayesian Inference and Learning in Gaussian Process State-Space Models with Particle MCMC. In Advances in Neural Information Processing Systems 26 (pp. 3156–3164). Curran Associates, Inc.
FHHU17: (2017) Deep Recurrent Gaussian Process with Variational Sparse Spectrum Approximation. ArXiv:1711.00799 [Stat]. SaDe17: (2017) Doubly Stochastic Variational Inference for Deep Gaussian Processes. In Advances In Neural Information Processing Systems. GSFT12: (2012) Exploiting compositionality to explore a large space of model structures. In Proceedings of the Conference on Uncertainty in Artificial Intelligence. LaSH03: (2003) Fast sparse Gaussian process methods: The informative vector machine. In Proceedings of the 16th Annual Conference on Neural Information Processing Systems (pp. 609–616). WiAd13: (2013) Gaussian Process Kernels for Pattern Discovery and Extrapolation. ArXiv:1302.4245 [Cs, Stat]. Ebde15: (2015) Gaussian Processes: A Quick Introduction. ArXiv:1505.02965 [Math, Stat]. BoKD16: (2016) Generic Inference in Latent Gaussian Process Models. ArXiv:1609.00577 [Stat]. MWNF16: (2016) GPflow: A Gaussian process library using TensorFlow. ArXiv:1610.08733 [Stat]. ENDH17: (2017) Identification of Gaussian Process State Space Models. In Advances in Neural Information Processing Systems 30 (pp. 5309–5319). Curran Associates, Inc.
SäHa12: (2012) Infinite-Dimensional Kalman Filtering Approach to Spatio-Temporal Gaussian Process Regression. In Journal of Machine Learning Research. Mack98: (1998) Introduction to Gaussian processes. NATO ASI Series. Series F: Computer and System Sciences, 133–165. EvMP05: (2005) Learning Multiple Tasks with Kernel Methods. Journal of Machine Learning Research, 6(Apr), 615–637. MiPo05a: (2005a) Learning the Kernel Function via Regularization. Journal of Machine Learning Research, 6(Jul), 1099–1125. RaKa17: (2017) Machine Learning of Linear Differential Equations using Gaussian Processes. ArXiv:1701.02440 [Cs, Math, Stat]. WKVC09: (2009) Multi-task Gaussian Process Learning of Robot Inverse Dynamics. In Advances in Neural Information Processing Systems 21 (pp. 265–272). Curran Associates, Inc.
BoCW07: (2007) Multi-task Gaussian Process Prediction. In Proceedings of the 20th International Conference on Neural Information Processing Systems (pp. 153–160). USA: Curran Associates Inc.
MDDF16: (2016) Recurrent Gaussian Processes. In Proceedings of ICLR. SnGh05: (2005) Sparse Gaussian processes using pseudo-inputs. In Advances in neural information processing systems (pp. 1257–1264). KrBo13: (2013) Spatial process generation. ArXiv:1308.0399 [Stat]. TuDR10: (2010) State-Space Inference and Learning with Gaussian Processes. In Proceedings of the Thirteenth International Conference on Artificial Intelligence and Statistics (pp. 868–875). DLGT13: (2013) Structure Discovery in Nonparametric Regression through Compositional Kernel Search. In Proceedings of the 30th International Conference on Machine Learning (ICML-13) (pp. 1166–1174). WDLX15: (2015) The Human Kernel. ArXiv:1510.07389 [Cs, Stat]. DaTL11: (2011) Variational Gaussian Process Dynamical Systems. In Advances in Neural Information Processing Systems 24 (pp. 2510–2518). Curran Associates, Inc.
FrCR14: (2014) Variational Gaussian Process State-Space Models. In Advances in Neural Information Processing Systems 27 (pp. 3680–3688). Curran Associates, Inc.
GaWi14: (2014) Variational Inference in Sparse Gaussian Process Regression and Latent Variable Models - a Gentle Tutorial. ArXiv:1402.1412 [Stat]. Tits09a: (2009a) Variational learning of inducing variables in sparse Gaussian processes. In International Conference on Artificial Intelligence and Statistics (pp. 567–574).